Our premium cold-weather jacket, the fully featured Primo Down Jacket uses 2-layer GORE-TEX® fabric for durable waterproof/breathable and windproof protection. To keep you warm and motivated in the harshest conditions, it's insulated with 800-fill power Advanced Global Traceable Down (goose down certified by NSF International, traced from parent farm to apparel factory to help ensure that the birds are not force-fed or live-plucked). Our premium cold-weather jacket, the fully featured Primo Down Jacket is the warmest and most protective insulated hard-shell jacket we make. It combines a durable, 2-layer waterproof/breathable and windproof GORE-TEX® fabric with a soft, insulating layer of Advanced Global Traceable Down (goose down certified by NSF International, traced from parent farm to apparel factory to help ensure that the birds are not force-fed or live-plucked) to keep your psych high as the temperature drops low. A DWR (durable water repellent) finish resists water and saturated snow, and an internal nylon lining manages moisture and glides smoothly over underlayers. The 2-way-adjustable, helmet-compatible hood has a laminated visor for optimal visibility. The Cohaesive® cord-lock system embeds cord locks inside the hood and hem for quick and easy adjustment while watertight, coated zippers with slim zip installation on the pockets and pit zips reduce bulk and weight. Vislon® zippers on the center-front and chest pockets are burly and easy to use with gloved hands. 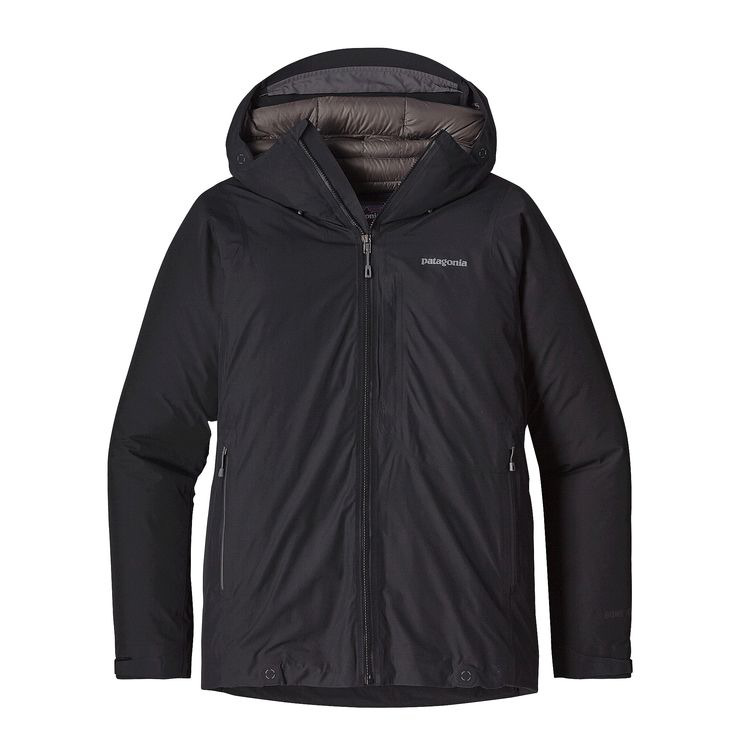 Other features include ventilating pit zips; a removable, fully adjustable, low-profile powder skirt; a goose down–filled draft collar for additional warmth and protection; and an embedded RECCO® avalanche rescue reflector. There are six zippered pockets: two handwarmers, one chest (includes a secure media pocket with cable routing), one on the forearm, and one interior stash, plus one interior drop-in for gloves or goggles.